SickRage has effectively replaced SickBeard as the personal PVR written in Python. It supports torrents far better than any other SickBeard fork out there to automatically download periodic media files as your personal PVR. 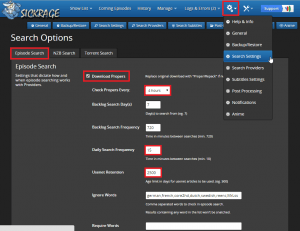 This guide will show you how to configure SickRage to work with both usenet and torrents. 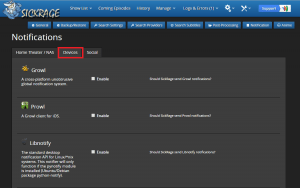 This SickRage tutorial will work on any platform including Windows, Mac OSX and Linux based systems. I recommend Transmission over uTorrent for Mac, Linux and Windows as it is less buggy. 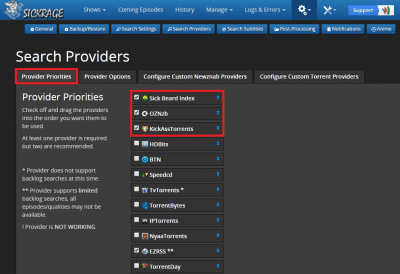 SickRage supports Sabnzbd and NZBGet for usenet, for torrents you can use uTorrent, Transmission, Deluge, rtorrent, Synology Download Station and others. Let’s get started and consider using usenet read: Comparing Usenet vs Torrents – Which is Better? This guide will walk you through setting up all the features SickRage has to offer. 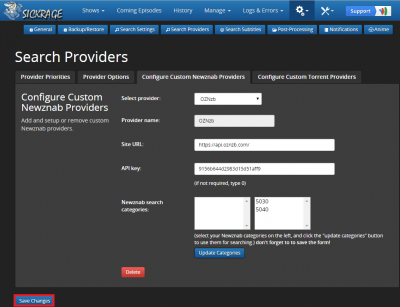 We will cover adding usenet indexers and torrent sites. 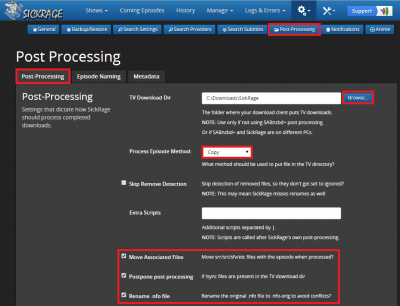 Getting SickRage to work with both usenet and torrents through post-processing to nicely organize your video files to facilitate library updates with Plex Media Server and XBMC. 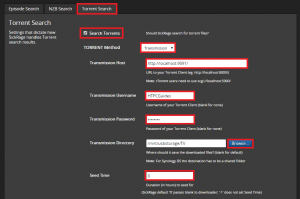 If you plan on using uTorrent for downloading and do not want to seed follow the Make uTorrent Automatically Stop Seeding Guide and then continue. 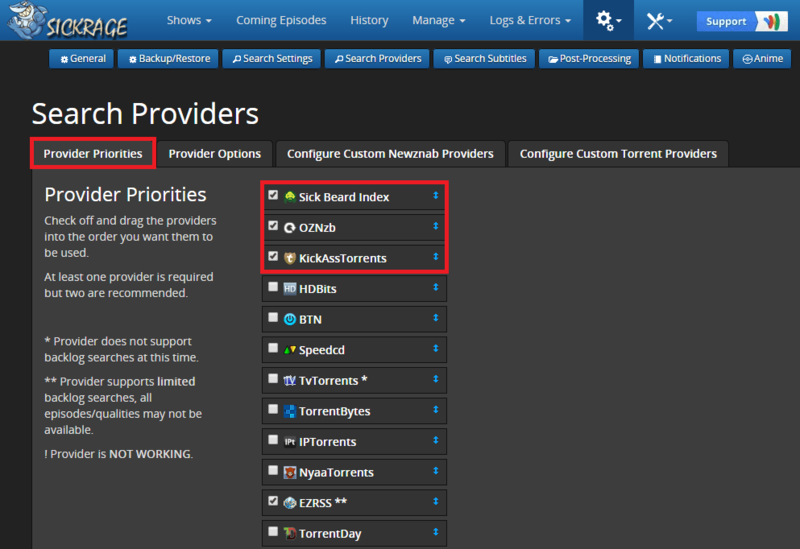 If you are using torrents then get some VPN access with PureVPN, Private Internet Access or try an SnT Seedbox (Review) to avoid legal letters and other nonsense. You can also configure Transmission to stop seeding when it completes a download. Before you begin it is important to understand SickRage’s post processing. Your SickRage Parent folder is the final folder you want videos nicely renamed and organized. Wherever you tell SickRage to download files using usenet or torrents, it is your SickRage monitor folder that you specify in the Post processing section. Refer back to this diagram if you find it confusing. In this section you will configure how often SickRage looks for episodes, how it downloads and which search providers it will use. 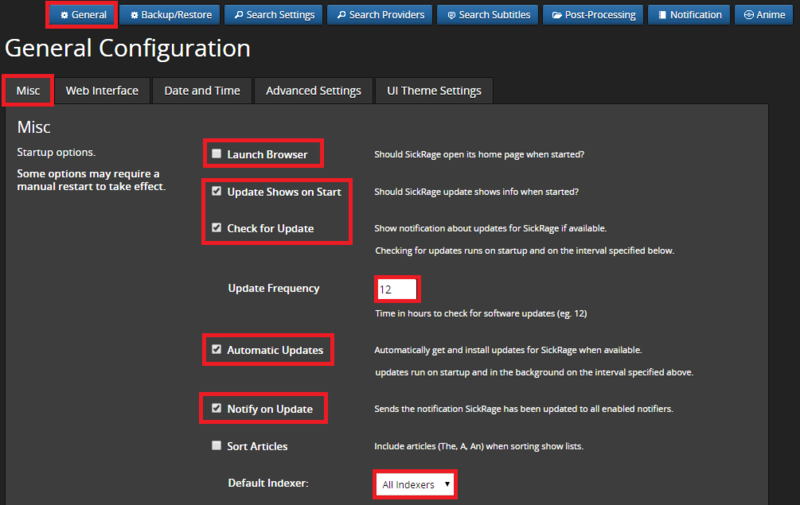 Find the tool icon in the top right and choose Search Settings. Check Download Propers and set it to every 4 hours. Scroll down and you can see the Whitelist and Blacklist options. SickRage will ignore any release that contains phrases or words in the Ignored words list. Separate them with commas. If you want foreign content you will have to delete your language if it is in the list by default. SickRage will only download releases that contain a word or phrase in the Required Words list. Again separate them with commas. 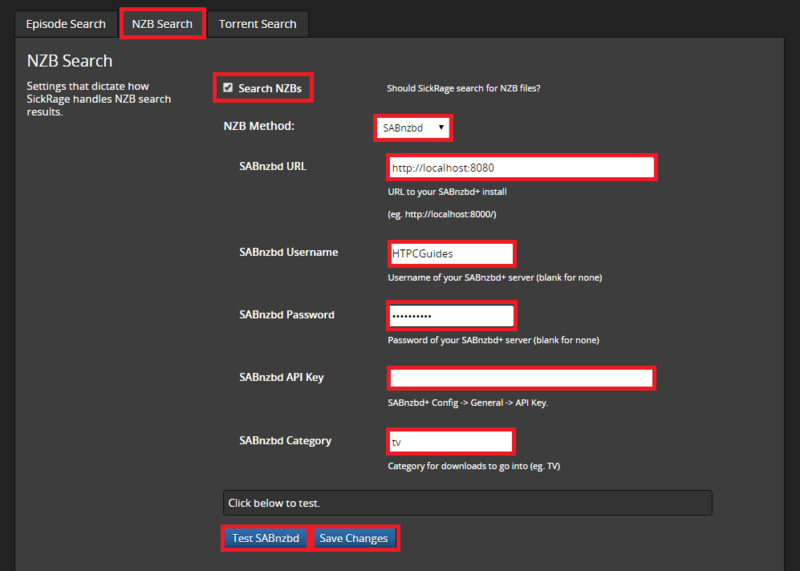 Click the NZB Search tab and follow the directions for either Sabnzbd or NZBGet. Enter tv in the Category column and enter a temporary path for SickRage to monitor for new downloads to process and rename. I have chosen c:\Downloads\sickrage*, it should end in ‘*’ so new job folders are not created. Click Add. Make sure you do not have Sabnzbd sorting enabled for this category! 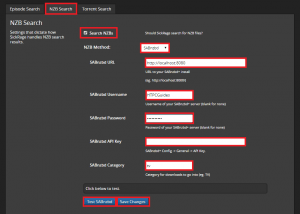 Check Search NZBs and then Sabnzbd in Send .nzb files to. 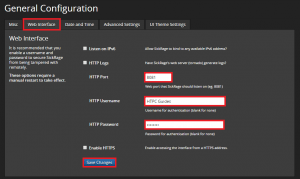 Add the URL of the box, http:// is a must, do not just use localhost, use http://localhost:8080 or whatever your port is. 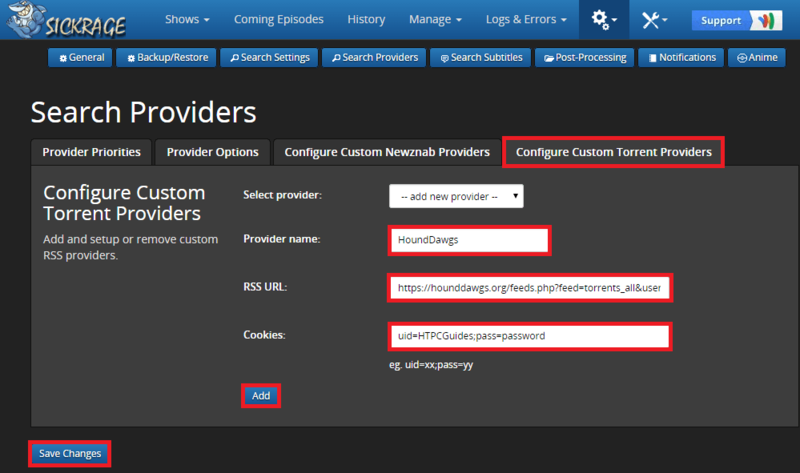 Add your username and password, and your API key choose the category for tv you have created in Sabnzbd. You should see the Success notification pop up, if there is a problem make sure your API key was pasted in correctly. 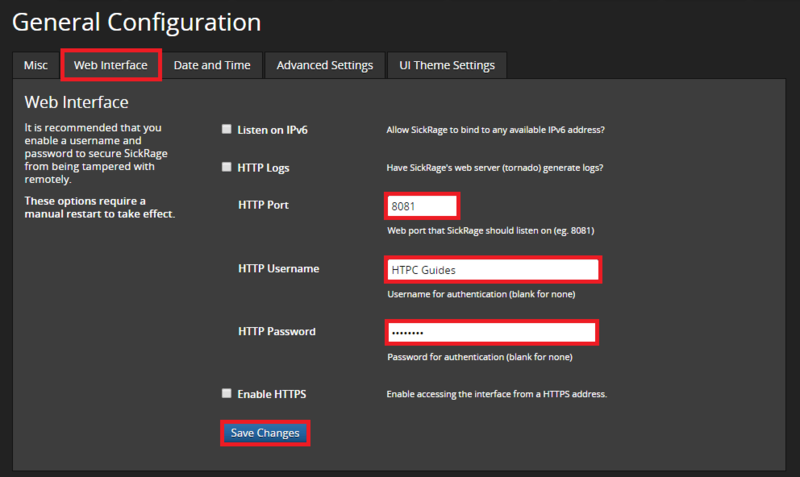 It may also help to change localhost to the actual IP address of the Sabnzbd box. Click Save Changes once you get the success notification. 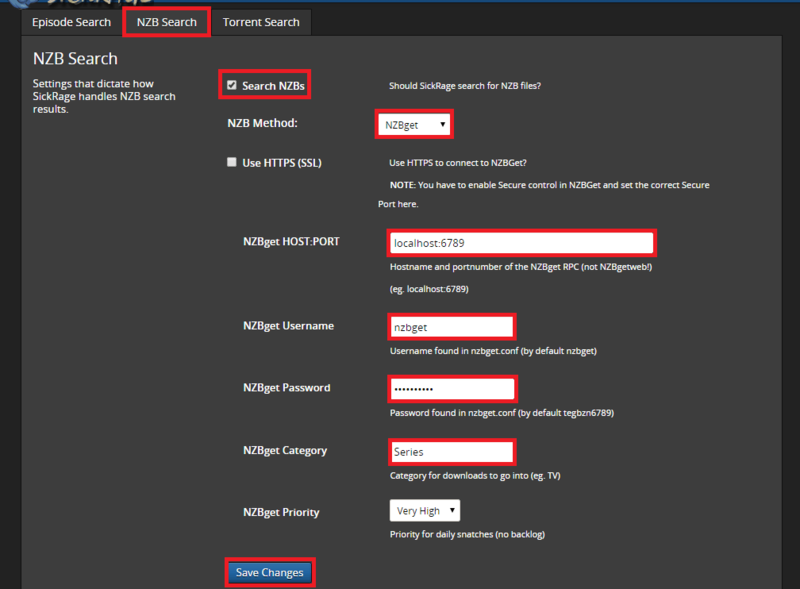 Open up NZBGet at http://ip.address:6789 and enter your username and password, default is nzbget and tegbzn6789. Click Settings and then Categories, scroll down to Category 2 called Series. Back in SickRage, click the NZB Search tab. 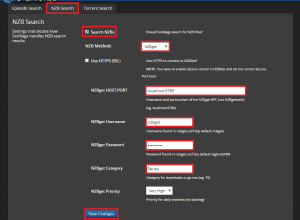 In NZBGet port:host you do not need to enter http://, just localhost will suffice but if you have problems adding http://localhost should work. 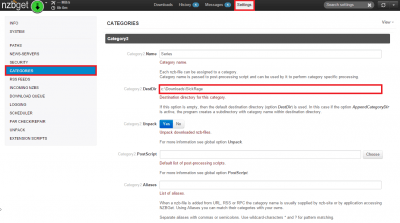 The NZBGet category is case sensitive so make sure it is correct, by default it is Series. Click Save Changes. When SickRage sends an nzb file for NZBGet to download, it will save them in c:\Downloads\SickRage for the Series category, which will be the same directory SickRage monitors for post-processing. 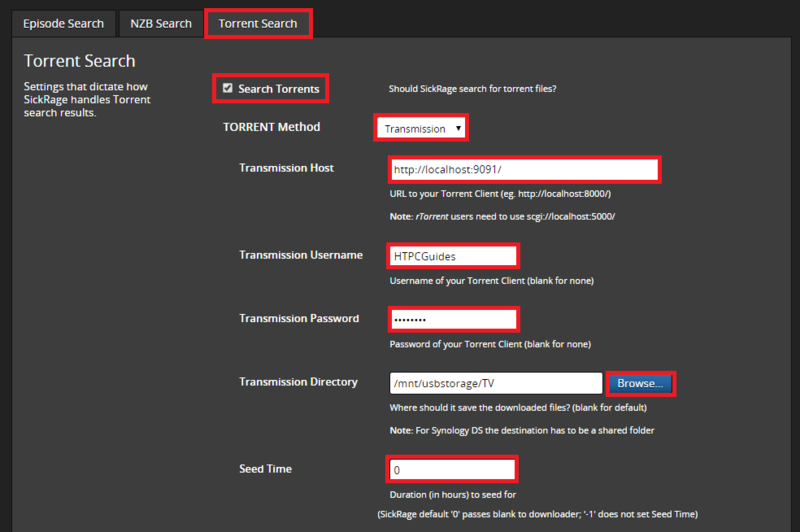 If you are interested in using torrents, click the Torrent Search tab. I only use them for backlog searches. Make sure you are using a VPN like Private Internet Access or PureVPN. Note: The label system in uTorrent is quite buggy so I recommend using Transmission for Windows instead. Check Enable WebUI. 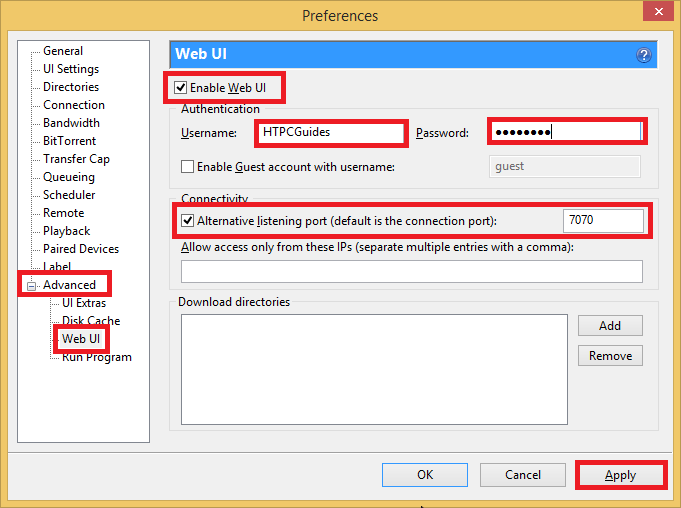 Choose a username and password then check Alternative listening port and choose a port. I’ve used 7070. 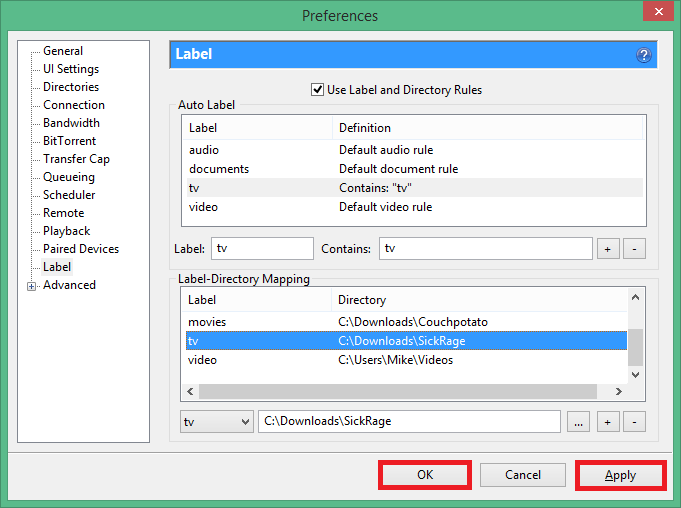 We are going to create uTorrent labels as well so that it doesn’t interfere with CouchPotato or other programs you have configured with uTorrent. 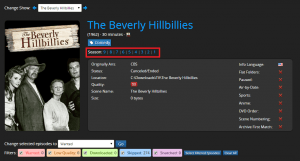 Enter tv for Label and tv for Contains, click the + button. 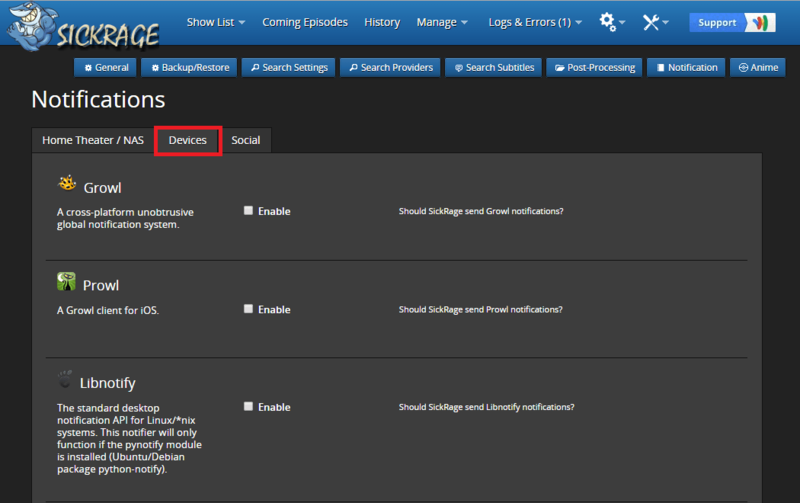 You should now see the tv Label added, create a directory by choosing tv from the dropdown menu in the bottom left. Click … and browse to your temporary SickRage download folder, I am using c:\Downloads\Sickrage which SickRage will monitor for new downloads to post process. Click the + button to add the Label-directory. You will see the category added, click Apply and OK.
Back in SickRage, click the Torrent Search Tab and check off Search Torrents. 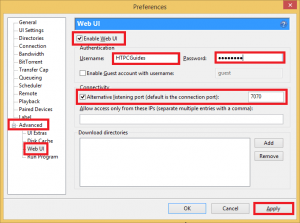 Choose uTorrent from the dropdown and enter the WebUI information you created in the previous step. 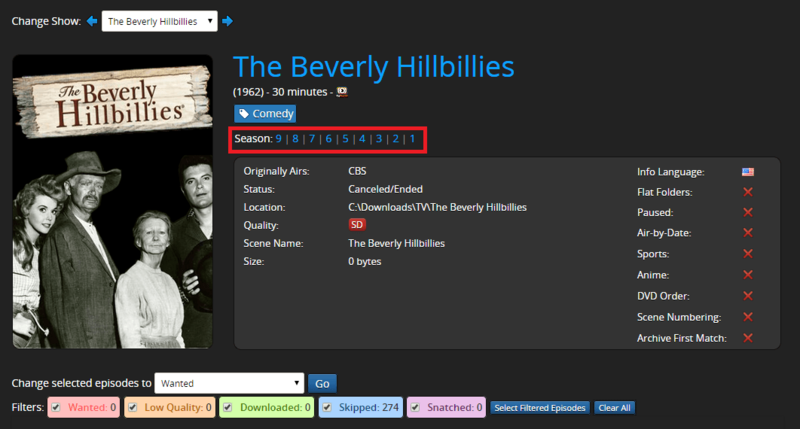 Add tv for the uTorrent Label and change the Seed time if you are on private trackers and need to seed. Leaving it at 0 lets uTorrent use its defaults. Scroll down and click the Test Connection button. You should see the test has been successful. You need the WebUI enabled so SickRage can communicate with it. My linux guides for Transmission cover this, for Transmission on Windows go to Edit -> Preferences. 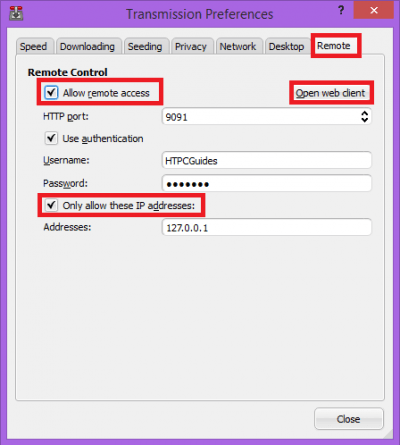 Enter a username and password, Only allow these IP addresses is a security measure, if you want remote access to Transmission from any computer disable it by unchecking the box. You can click Open web client to view the Transmission web interface. Back in SickRage, click the Torrent Search tab and check Search Torrents. Choose Transmission from the dropdown menu. Enter the url with default port which is http://ip.address:9091, your username and password. 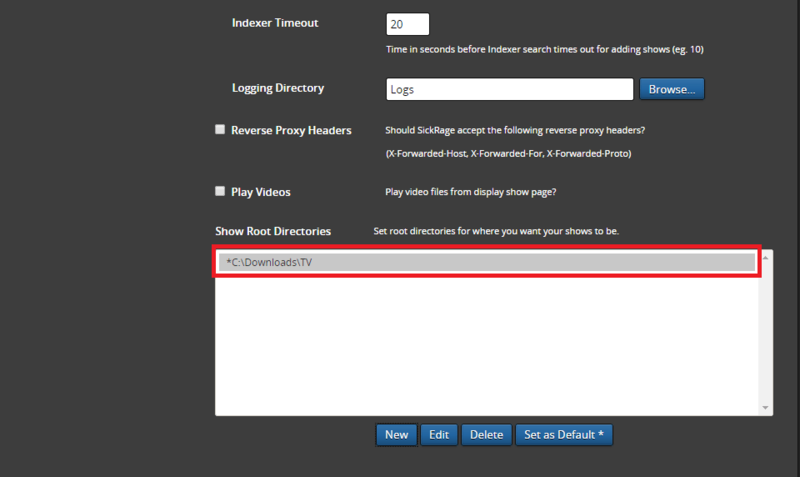 You can also specify the download directory by clicking Browse. 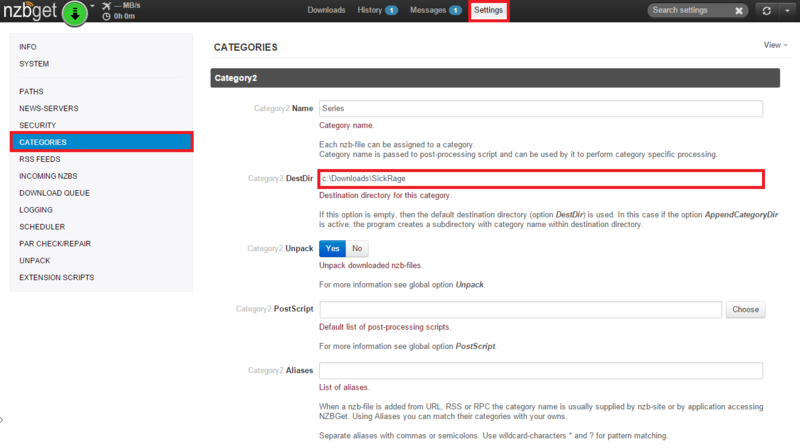 You will use this download directory as your post-processing folder for SickRage to monitor (i.e. 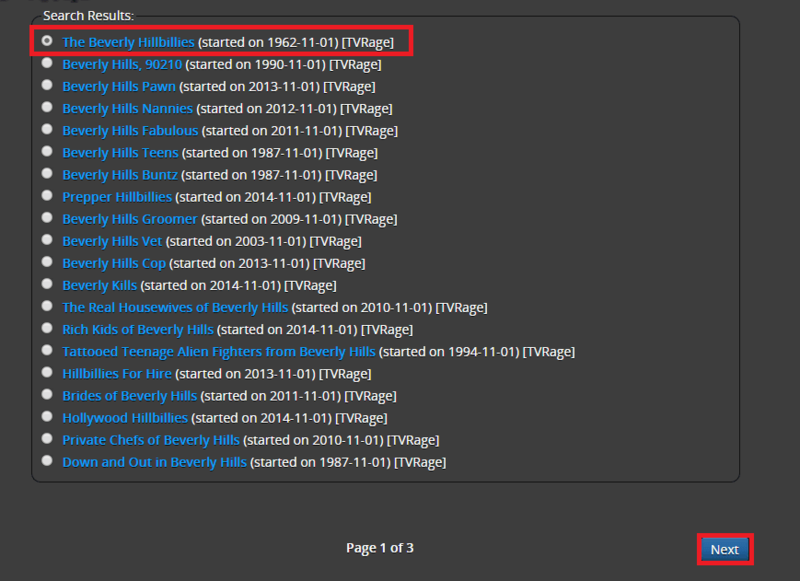 SickRage TV Download Dir for SickRage Post Processing), it should not be your final TV archive folder. This section is very important. For me, the ideal setup is grabbing new content from usenet and backlog content from torrents with UsenetServer and its free VPN. 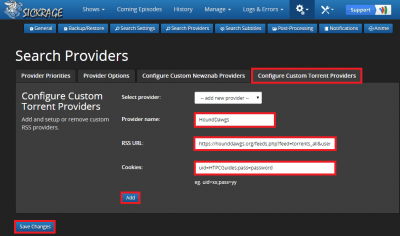 Setting the checkbox next to a provider enables it. 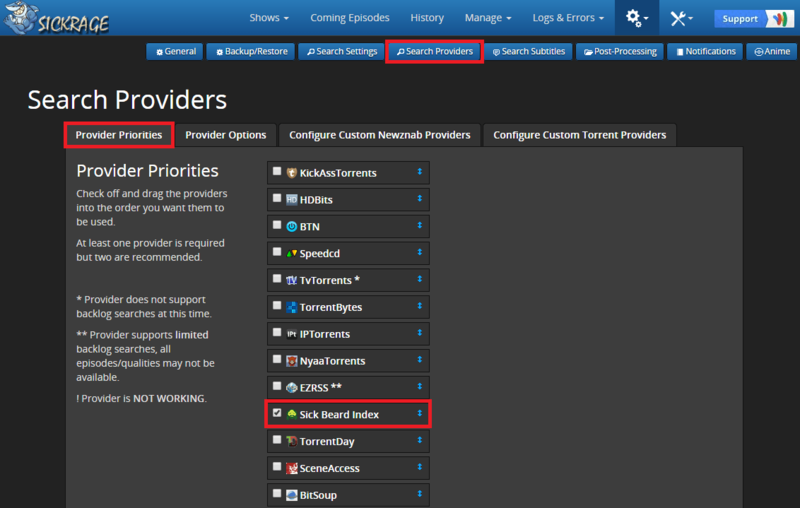 You can adjust the priority of the providers by clicking on the blue double arrow and dragging them up as shown. 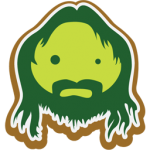 The SickBeard index doesn’t require any user credentials and will get you a lot of fresh releases. I’m going to show you how to add custom providers first and then we’ll return to this tab to sort the priority. I am adding OZnzb as a custom search provider, this will work with any Newznab supported indexer (which is most of them). You will need your API key. Click Save Changes and the categories should update. Give it a name and add your RSS URL which you can find with the orange RSS icon on your private tracker. Click Add and Save Changes. 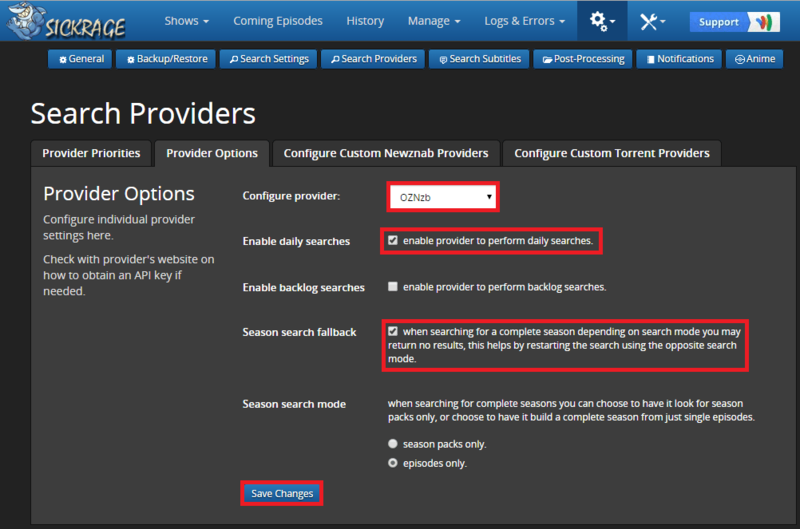 After you have added all your providers you will want to put them in priority order and control which will be used for daily searches (new episodes that have not aired yet) and backlog searches (episodes that aired a while ago). You need to put a check mark to enable the provider under Provider Priorities. I have put a usenet indexer at the top and Kickasstorrents underneath. Click Provider Options to choose how each indexer or tracker behaves. 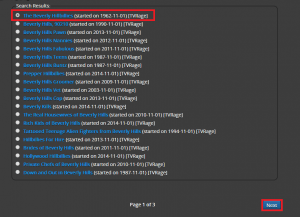 I have put my OZnzb indexer first and told SickRage to only use it for daily searches. 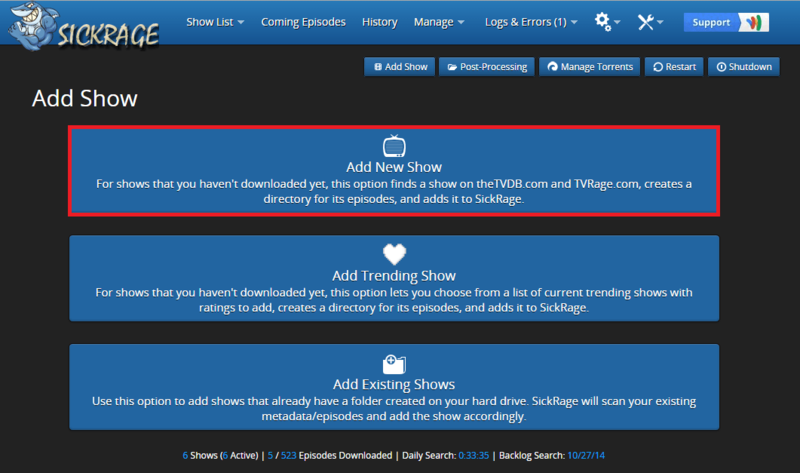 You are welcome to check backlog searches as well but because SickRage doesn’t have proper failed download handling just yet, I advise you to use usenet indexers for daily searches of new episodes and torrents for old episodes. For Kickasstorrents I set it to Backlog searches only and Minimum seeders 5, you can lower the minimum seeds but you may get stalled or very slow downloads. You can choose Confirmed downloads only to increase the quality reliability. Remember this diagram! SickRage monitor is your TV Download dir below. Post processing helps organize your files automatically. 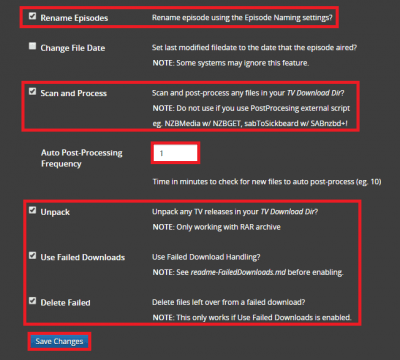 SickRage can scan your download folder every X minutes, rename the episode and place it in the folder in which it belongs. 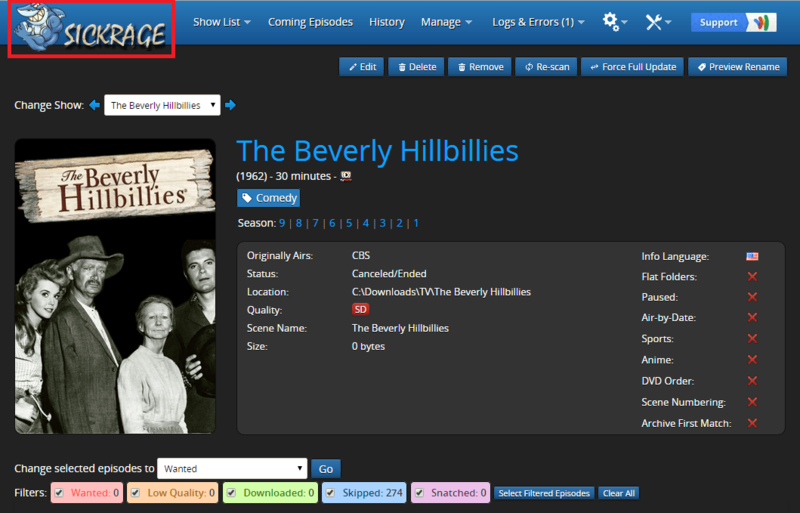 This makes your library ready to be imported into XBMC or Plex. Click the blue Post Processing button and then the Post Processing tab. Browse to the directory for SickRage to monitor. This must be the directory your usenet downloader or torrent downloader is placing its files. I used the example c:\Downloads\SickRage. For the Process Episode Method I use Copy or Move. Move is undesirable if you need to seed afterwards, then use Copy instead. 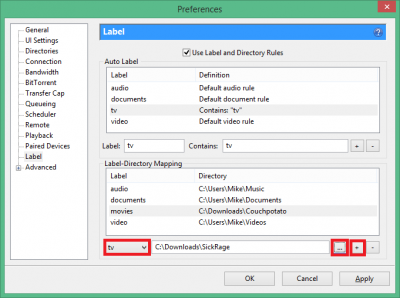 If you don’t have much space you can use a symbolic link which links from your original download directory to your final video archive folder. Hard link is also an option on Linux and Windows but on Windows the hard link cannot span partitions. You can check Move associated files so any subtitle files get moved along. I left Postpone post processing enabled and Rename .nfo file checked as well. 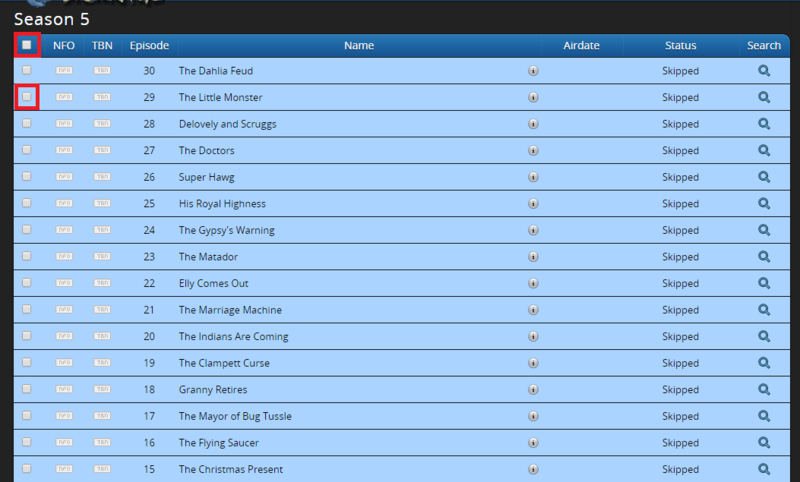 Scroll down and check off Rename Episodes which will use the settings specified in the Episode Naming tab. Check Scan and Process and set the Auto Post-Processing frequency to every 5 minutes or so. Check Unpack in case the episode is packed in rars, you will need to have an unrar program installed on your system. Check Use Failed Downloads and Delete Failed. Click Save Changes. The tab Episode naming allow you to change how the episodes are renamed. The default settings are fine. 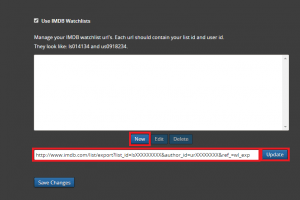 The tab metadata allows you to download metadata for XBMC from various sources. Click the blue Notifications button. 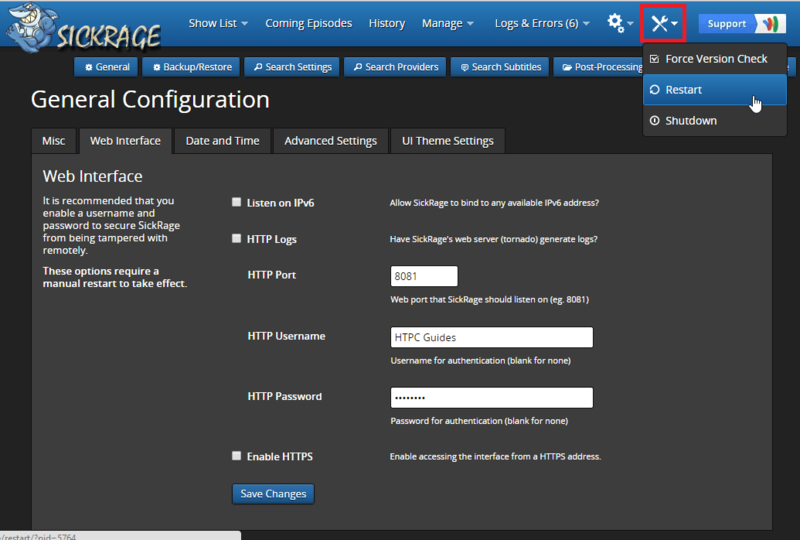 Here you can have SickRage push library updates for XBMC and Plex Media Server among others, you need to enable XBMC Web UI access for it to work. 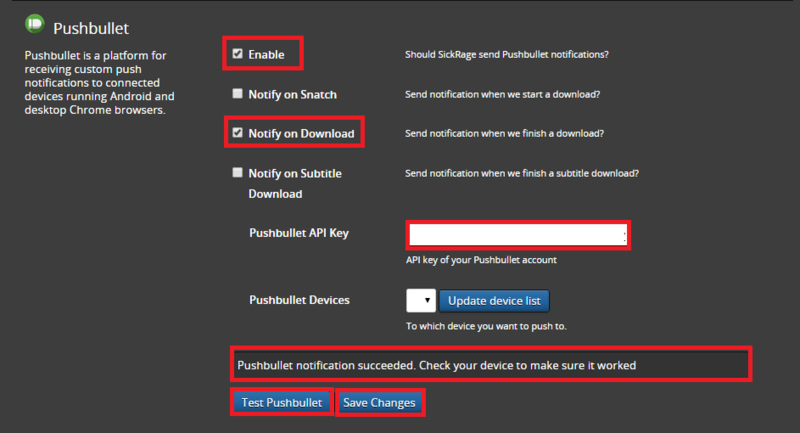 If you use Pushbullet then scroll down and enable it. Uncheck Launch Browser if you don’t want a browser to load each time SickRage starts up. I also checked Update Shows on Start and Check for Update and set the Update frequency to every 12 hours. Automatic Updates is also checked so SickRage will just autoupdate when it finds improvements. 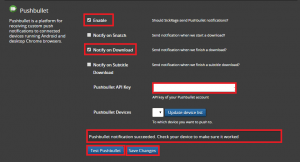 Notify on Update is checked so I can get Pushbullet notifications when SickRage has updated. The Default indexer can be whatever you like. You may find you have to switch between TVDB and TVRage for accurate series information. 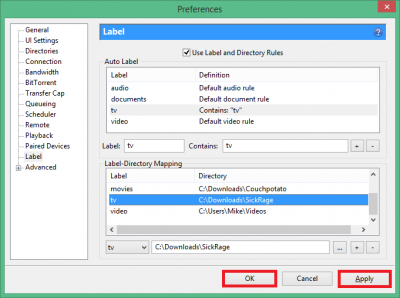 Scroll down and set your default TV show folder. This should be the folder where all of your shows will end up. 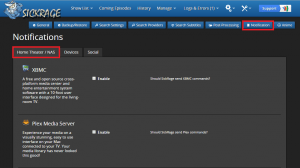 It can be the same location as your Plex or XBMC library. Click New. 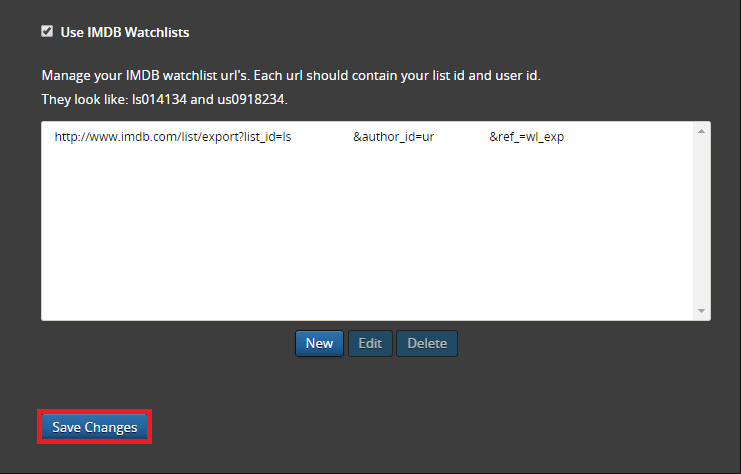 Back in SickRage check IMDB Watchlist, Click New and paste your Export this list IMDB URL in the text box that pops up. 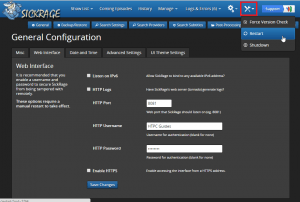 Here you can specify a username and password to access the SickRage interface. You get these options, I will only cover adding a new show you do not already have in your library. Add the name of your show and choose your indexer. 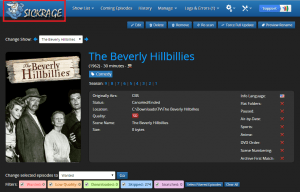 I am using the public domain show Beverly Hillbillies. You will see a list of results, choose the correct one and click Next. If you want all the episodes that have aired, set the status to Wanted here. SickRage will automatically get new unaired episodes. 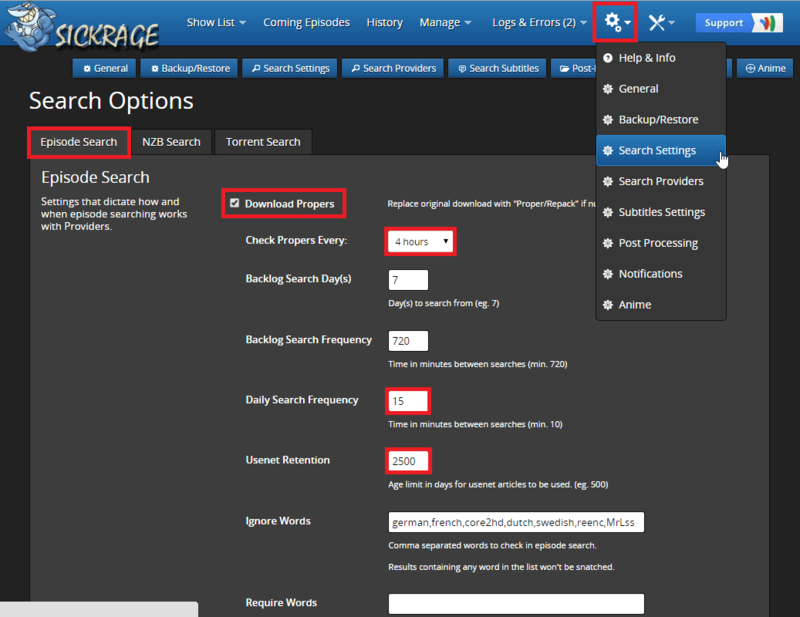 SickRage will now search for the episodes automatically. If automatic post processing fails for any reason you can always manually post process. 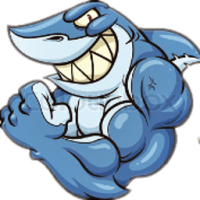 After clicking the Shark logo, hit the blue Manual Post-processing button. Here you can manually browse for a folder, choose if it should copy, move or link the episode. Click Process and the script will do its thing. That concludes the quite lengthy SickRage guide. If you have any questions or feedback please use the forum.